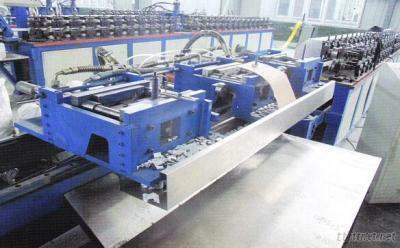 We are specialized in the production of roll forming machinery and equipment. Such as: Full automatic ceiling T-grid machinery, full automatic Gypsum profile machinery, full automatic aluminum ceiling production line, color steel roof tile equipment, Storage shelves equipment, Tube welding machine, etc. Our company is a high-tech manufacturing one which integrates design, research and development, moud processing and manufacturing, automation design and innovation all together. We have a top designing team, and a group of highly skilled technical workers which enables us to provide perfect services to our clients. We forges ahead with determination and strives for perfection. It takes the leading position of the cold-formed molding technology. To promise the growth of the productivity and achieve reformation and innovation time and time again, so as to produce the most satisfying production machinery for our clients.